‘My Sister’s Keeper‘ centres on a 13 year old girl called Anna. Anna would never have been born if it were not for the fact that her elder sister Kate was diagnosed with leukaemia. At the age of two she desperately needs a bone marrow transplant, but no one in the family is a match and it is extremely likely that a suitable donor will be found elsewhere. However, with the advances in medical science, it was possible for Kate’s parents, Brian and Sara, to conceive another child, and through IVF, to select the one which will be an identical match for Kate. Thus, Anna entered the world, and within hours was acting as a donor for her elder sister. Unfortunately, although initially successful, things didn’t finish there, and over the years Anna is called upon to donate more to her sister in order to help her beat the disease. This is until one day Anna decides she has had enough, and calls on the services of lawyer, Cambell Alexander, to help her achieve medical emancipation from her parents. This would mean that she would get to be the one to choose whether she donated any more, and as Kate is in a critical condition and in desperate need of her sister’s kidney, speed is of the essence! The novel focuses on what happens after this moment leading to a very swift court case. In fact the duration of present time that the book covers is only a week! However, interspersed throughout are flashbacks to when the girls were born and subsequent significant events up to the present day. The book also covers the fallout from Anna’s actions on the family and we see them falling apart as no one knows what to do or say for the best. I think this is a really well written book and the characterisation of the family is superb. Anna is a strong character and you really feel for her when you think about how over the years she has had no choice in what she has been asked to do, with most of the procedures being drawn out and painful. This does not mean that she does not love her sister, because she does, but she is torn between helping her and having a life of her own. You don’t get to know Kate that well though as none of the story is told from her perspective. She is obviously a very sad character always living with her leukaemia, but also a very ordinary girl too. One of her favourite moments is during a game of football when her brother knocks her over. Their parents are livid, but he claims he just forgot! This is a very moving moment as it makes Kate very happy – all she wants is for people to forget and just treat her the same as everyone else! There is also an older brother Jesse, who I think is perhaps the most poignant character of all. Over the years he has pretty much been neglected as he was not able to be a match for his sister. All of the parents’ energy seems to be focused on the two girls and the ensuing medical crises, so much so that he is barely noticed. He comes and goes, does his own thing and eventually turns to arson, really as a plea to be noticed. The parents, Sara and Brian are very interesting too. Sara is so intent on saving the life of her elder daughter that she totally neglects Anna’s needs. She is very angry when Anna brings about the court action. She cannot see that by wanting to save her child she is doing anything wrong, and that she is causing any harm to her youngest. Brian is a little more philosophical and he tries to help Anna, although he still desperately wants Kate to live. So you can see that when reading this book you will get caught up in a very complex family. Also, you will probably find yourself sympathising with all of them as I did! And there are no easy answers – you can’t help thinking ‘what would I do?’ were I in the same situation! Probably very few of us do know what we would do! I found reading this quite painful at times – as a parent, the prospect of losing a child is unthinkable, but this book does bring home just how fragile our whole existence can be. This book made me think about things that I wouldn’t really choose to! And by doing so, it raises a lot of moral and ethical issues as well. As I said earlier, the book only covers the space of a week. Each chapter is written in the first person, but from a different person’s point of view. As there were six different people telling the story, this could have been quite difficult to follow, but as I found it so absorbing this didn’t cause too many problems. (This was surprising as the different storytellers have put me off a bit in other Picoult books). The story does rush towards its conclusion and it really is an emotional ride. Some of the details about the illness and the medical procedures are quite distressing as well. I knew the ending was going to be very emotional and I prepared myself for floods of tears which I definitely couldn’t control at the end. However, you can never second guess Jodi Picoult and predict the conclusions. I myself was quite shocked at the end of this one. So overall I really recommend this book, although it is not one to read when you are feeling a bit low. 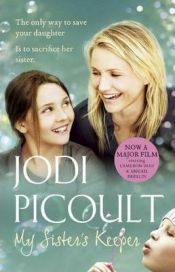 At the end there are some questions to Jodi Picoult and these are quite illuminating as she tells why and how she wrote the story. One Comment on "My Sister’s Keeper"
Hi, I can highly recommend this book, I read it a few years ago and it certainly raising some interesting and difficult issues. I found myself drawn into some deep thoughts and feelings on the subject. As the article says it’s about having a baby to keep another child alive and then using that baby to give donations to the other child. It seems so simple in the beginning and understanding to want to help save the first child but as time goes on and more and more is needed from the 2nd (well actually third because they already have a brother) child both the sisters find it hard. Then of course there’s the brother and how forgotten he becomes in the whole saga. It really is worth a read and then makes you want to fight for these cases in real life – if we don’t stick up for what we believe – things will just go ahead without the long term consequences being thought of.